“Twins,” a story of the Libyan uprising from Hungarian writer and war correspondent Sándor Jászberényi is featured on Pilvax Magazine. And so yet another Central European writer has devoted his attention to the Arab/Islamic world without a peep of warning from Fox News. Maybe they’re distracted by some upcoming political event. Otherwise I can’t explain it. 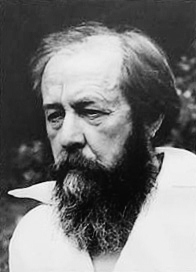 Were you familiar with Solzhenitsyn at that time? I don’t think at that time Solzhenitsyn was familiar with himself. No, later on. When One Day in the Life of Ivan Denisovich was put out, I read it instantly. I remember, speaking of Akhmatova, talking about One Day, and a friend of mine said “I don’t like this book.” Akhmatova said: “What kind of comment is that—‘I like it’ or ‘I don’t like it’? The point is that the book ought to be read by two hundred million of the Russian population.” And that’s it, ya? Though a bit outside of literalab’s geographical purview, the work of Italian writer Dino Buzzati definitely has a strong aesthetic connection to Central Europe, as his story “The Time Machine,” featured in Electric Literature’s Recommended Reading series, makes very clear.